K'NEX Nintendo Mario Kart Wii ..
Watch Mario try to dodge the Thwomps from the Bowser's Castle Track in his super fast battery-powered motorized Wild Wing Kart * Use levers to activate the Moving Thwomps obstacle and send either Thwomp crashing down on the track, just like in the game * Buildable Mario figure plus a bonus collectible banana peel item from the game * 139 colorful durable plastic K'NEX pieces, including 6 pieces of buildable, interconnectable track system compatible with other K'NEX Mario Kart Wii Sets * Recommended for builders ages 6 and up 3. 2. 1. GO!! K'NEX lets you bring your favorite Nintendo game to life with the Mario Kart Wii Mario vs. Thwomps Track Building Set! Challenge your imagination as you create countless adventures building this set and watch Mario race past the Thwomps from the Bowser's Castle Track in his super-fast motorized Wild Wing Kart. In his battery-powered race car, Mario zooms down the track at high speeds - but he better be careful, because two devious Thwomps are waiting in the air above him, ready to crush Mario and knock him and his kart right off the track! Press down on the lever above either Thwomp to send it slamming to the ground, just like in the game, and watch as Mario tries to speed past this obstacle for his chance at victory. This building set includes all 139 pieces you'll need, along with step-by-step instructions, to construct your very own scene straight out of Mario Kart Wii. Build Mario and his Wild Wing Kart, decked out with real rubber wheels and a super-fast battery-powered motor (requires 2 AAA batteries, not included), plus two bonus collectible items from the game: a banana peel and a green shell. The set also includes 6 pieces of buildable interconnectable track, in addition to a moving Thwomps obstacle with two Thwomps. Colorful sticker sheets offer even more creative opportunities to decorate the karts and the track with sweet Mario- and racing-themed art. All of the track pieces are compatible with other K'NEX Mario Kart Wii sets, so you can expand your collection and build the ultimate closed loop Bowser's Castle Track - or customize your course by combining different sets for even bigger and more creative tracks. Collect and build all of the Mario Kart Wii figure, kart, bike, and track building sets - there's a ton - and compete with your friends on all of your favorite tracks from the game! 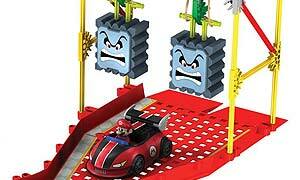 The K'NEX Mario Kart Wii Mario vs. Thwomps Track Building Set is recommended for ages 6 and up. Standard K'NEX parts made in the U.S.A. Special components made in China. Packaged in the U.S.A. 3…2…1…GO! Bring your favorite Nintendo video game off of the Wii and into real life! 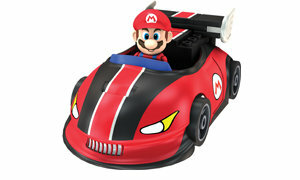 Mario Kart Wii fans ages 6 and up can now collect, build and race all of the best characters and fastest karts. Build replicas of tracks from the game – like Bowser’s Castle or Mario Circuit; OR design and customize your own tracks. Speed past obstacles like Thwomps, Lava Plumes, Goombas and Piranha Plants – but make sure you don’t get hit. First through the finish line wins! Build Mario in his super-fast, motorized Wild Wing Kart from Mario Kart Wii! Collect all of the sets to build BIGGER tracks, complete with obstacles like Fire Cogs, Lava Plumes, Fireballs and more.